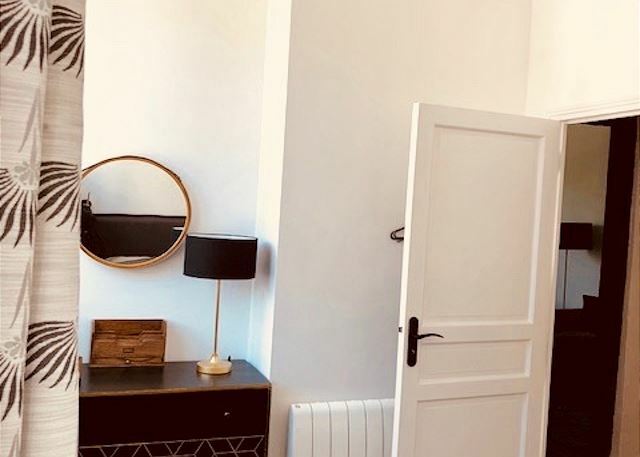 Vacation rental apartment. Sleeps 2, 1.5 bedrooms, 1 bathroom. No pets allowed. 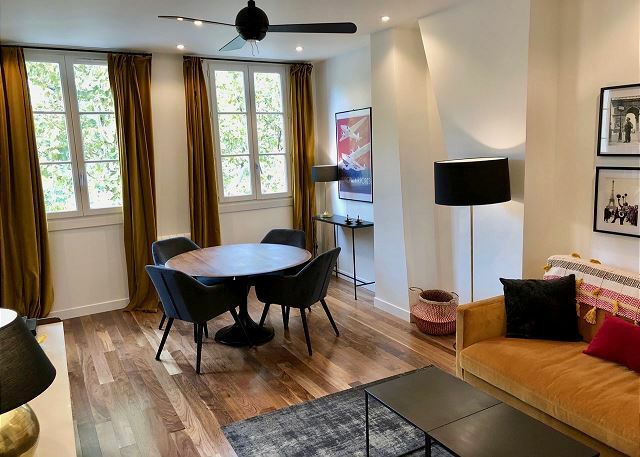 Enjoy the authentic Parisian life in this fully renovated, elegantly modern apartment nestled in the oldest and one of the most desirable and central areas of Paris, the 5th arrondissement. 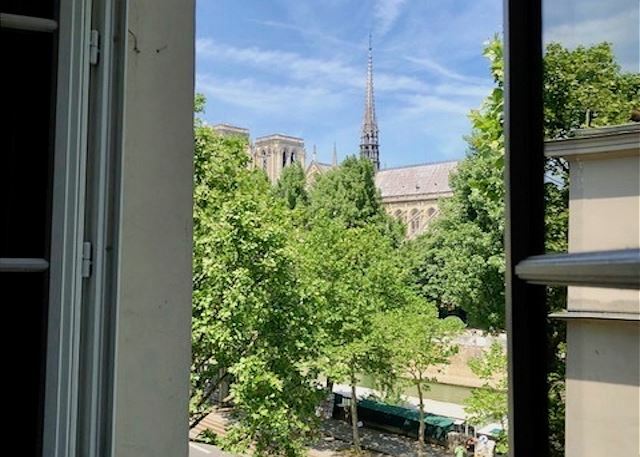 The apartment overlooks one of Paris's most famous monuments, Notre Dame Cathedral and the beautiful Seine river. 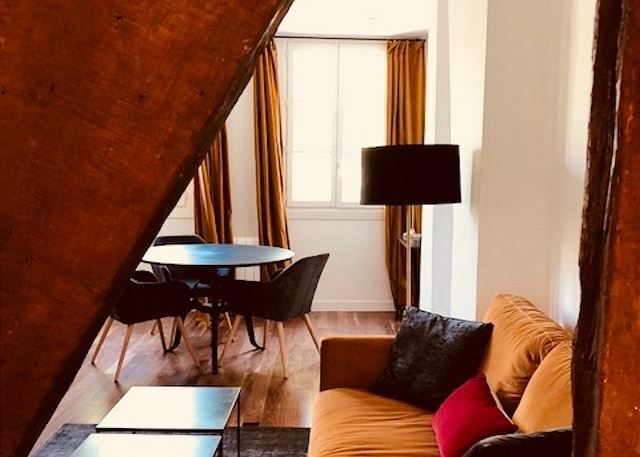 This lovely fourth-floor apartment is on one of the oldest Parisian streets, in a beautiful 16th Century corner building. 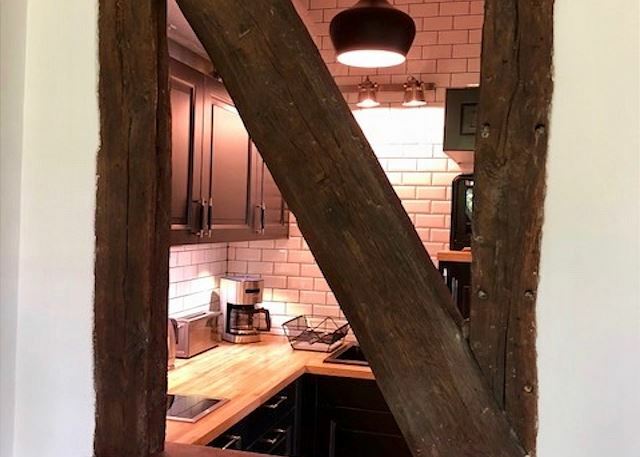 Stepping in from the gentle bustle of restaurants and museum of St Michel and the Marais just across the bridge, you are welcomed by a beautifully appointed apartment, completely renovated in May 2018, with original wood wall beams. 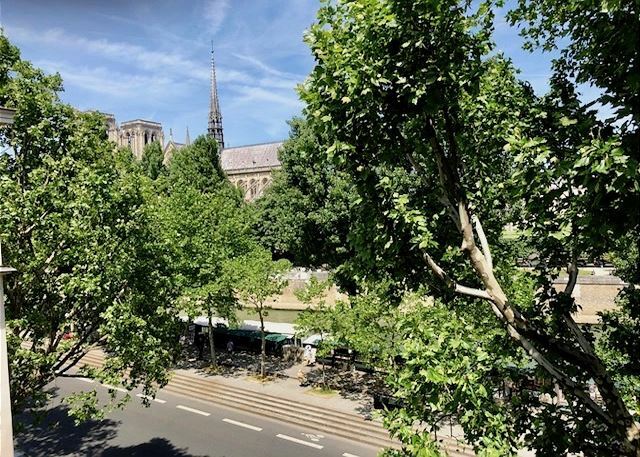 The Seine river, just out of your doorstep, is a rare convenient addition, offering places to dine or drink on the boats, visit Paris by water bus, enjoy romantic strolls along the water or keep in shape with a beautiful morning run. This fresh, light-filled apartment has everything you need to relax after a day in the city. Step into the elegant living room, decorated with stylish furniture; you can let yourself unwind on the comfortable furnishings. 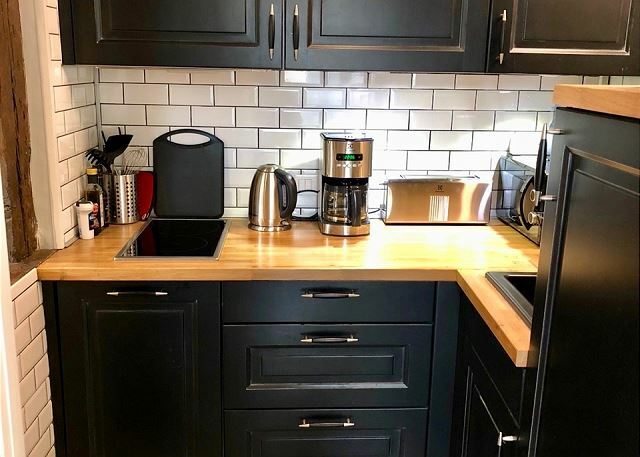 The well-equipped kitchen with refrigerator, dishwasher, convection oven, microwave as well as a Nespresso machine and a traditional coffee maker is a perfect area to prepare breakfast with delicious fare from the local French bakery. Likewise, you can make a gourmet evening meal you would have gathered from the local artisanal food stores or the outdoor market just one block away. 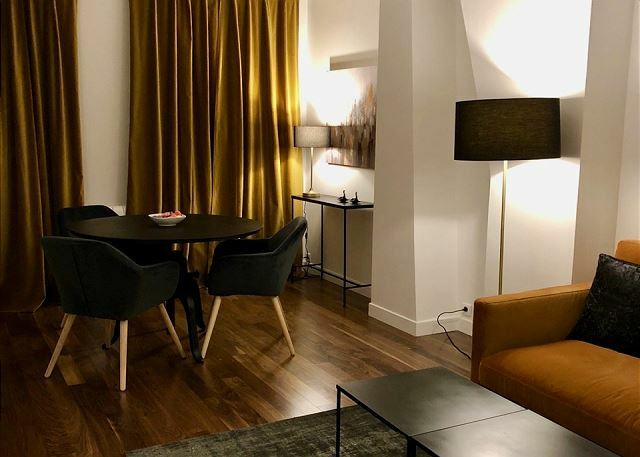 You will undoubtedly enjoy the unique atmosphere of the neighborhood and the exquisite view of Notre Dame from your dining table. 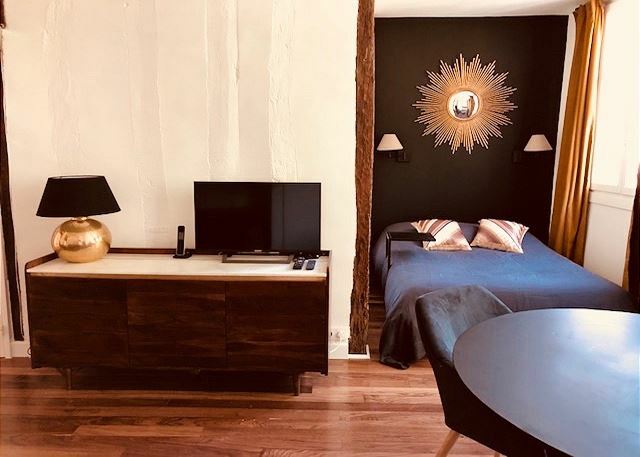 The bedroom, facing a quiet side street has a comfortable queen sized bed with memory foam, perfect for a good night’s sleep after a day of enjoying all of the wonders of Paris. The bedroom also boasts plenty of storage space with a full closet and beautiful chest of drawers. The Living room also has a comfortable convertible sofa bed in the quaint alcove and can be separated by a curtain for added privacy. 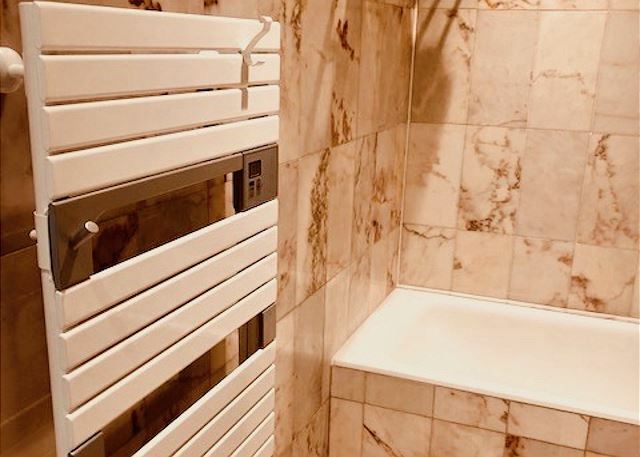 The marble bathroom offers a large shower and bathtub combination with towel warmer and a very convenient washer and rare separate dryer unit. 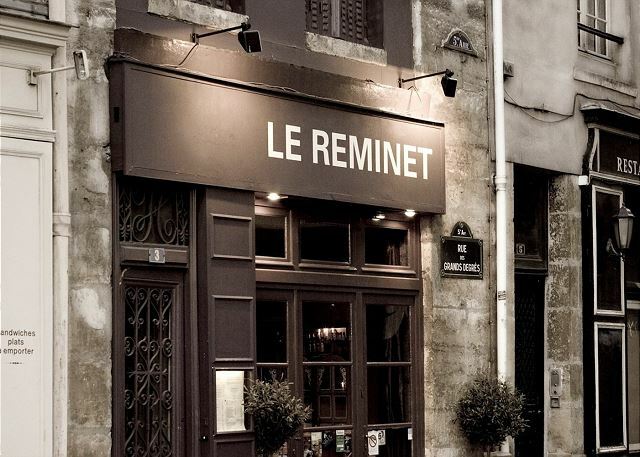 Also known as the Latin Quarter, the 5th arrondissement is one of the best known of the city's central districts and home to the famous Sorbonne University where Latin was the language the medieval period students used to speak. The 5th was also the core of ancient Gallo-Roman Paris, as revealed in a number of otherwise rare archaeological remains that can be seen within the district. 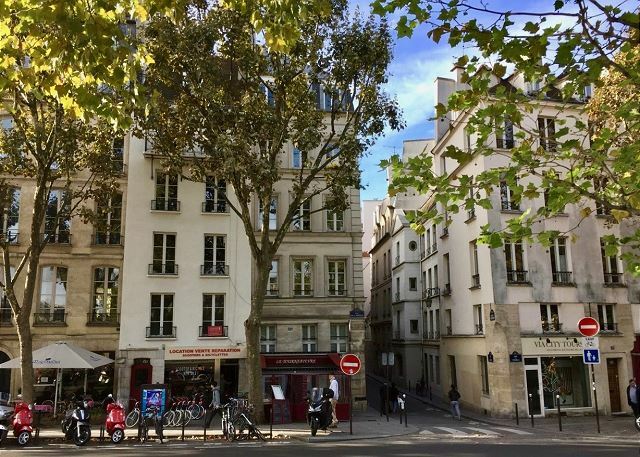 It's also known for its bookshops, including the famed Shakespeare & Company. Family-friendly attractions include the Jardin des Plantes botanical gardens and the National Museum of Natural History. The stately Panthéon building holds the remains of notables like Voltaire and Marie Curie. The Fontaine Saint-Michel is the historic monumental fountain located in Place Saint-Michel. 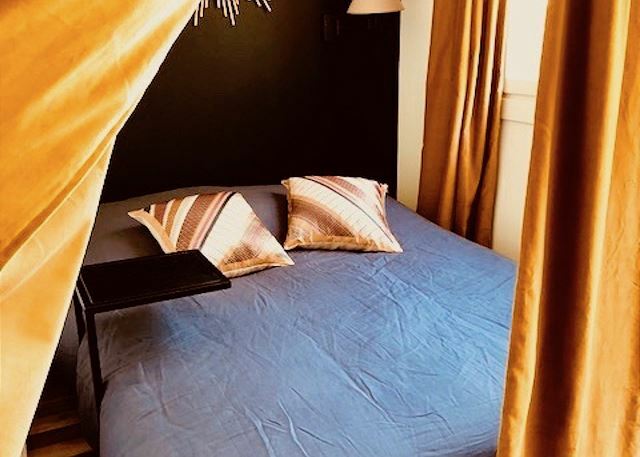 This ideal location is also within a short distance of the Eiffel Tower, The Louvre, Musée d'Orsay, Musée Rodin and École Militaire. 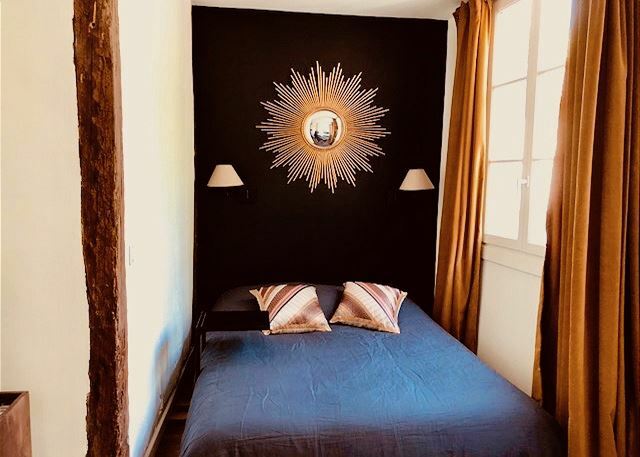 The Arc de Triomphe, Hôtel de Ville and the iconic Palace of Versailles are just minutes away as well. Our house away in Paris! Wonderful location and best of all the place is exactly as shown and described! 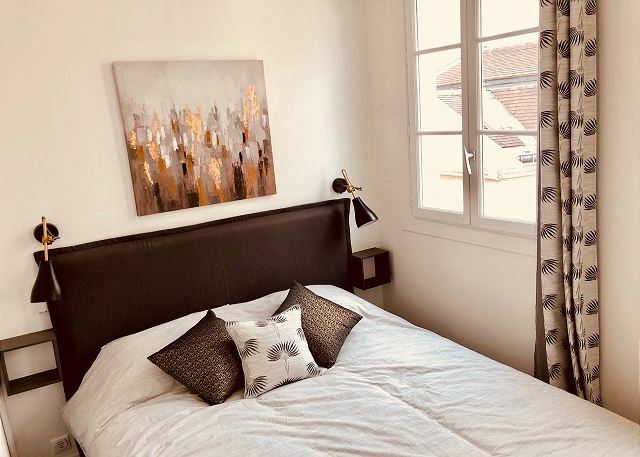 Patricia was so nice and gave us clear instructions on how to work the TV, internet, phone etc The entire place was well thought out and we could not have selected a better home for our home away in Paris! 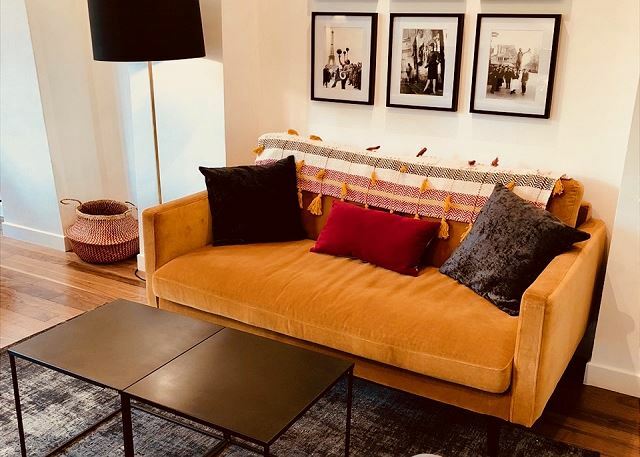 This apartment was so beautiful and had everything my husband and I needed! The area was amazing and we loved the restaurants and bakeries. We will book this apartment again! 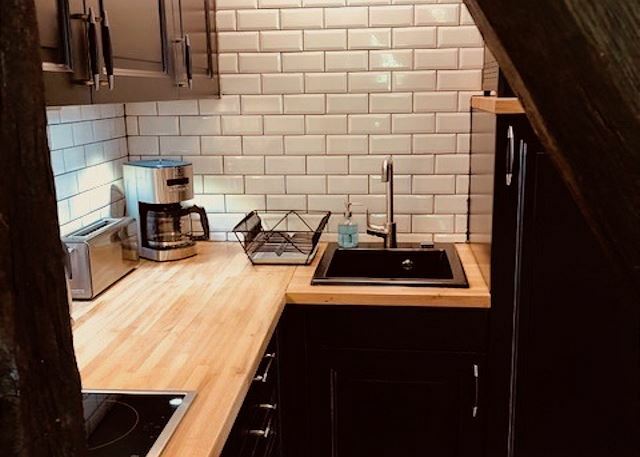 Well designed, warm & comfortable home across Seine from Notre Dame. Personal assistant meets and welcomes you to apartment & arranges private driver to airport. 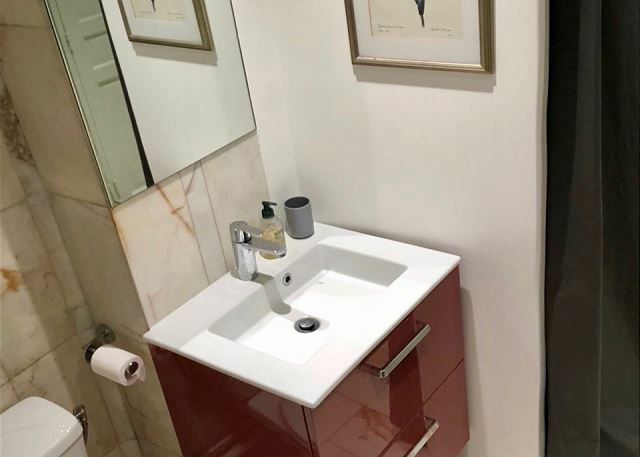 Spiral staircase leads to corner unit private floor in building, no neighbor noises, well insulated, full service kitchen-cute as a button, super comfortable bed with warm duvet, washer/dryer, bathtub/shower, good water pressure. Delicious escargot & mozzarella/tomato salad at floor level restaurant. Very safe, good internet, bluetooth speaker, ceiling fans, velvet couch and curtains, tons of windows, close to groceries, perfect! 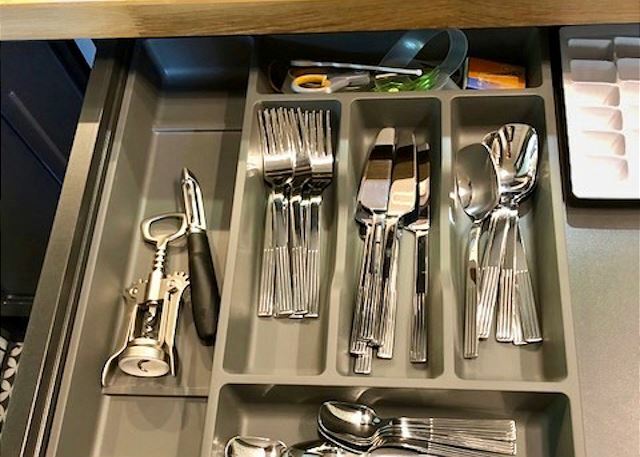 Stay here, everything is fresh and new!